When I was waxing eloquently about Mustard and Mustard Paste in my post MySpice -- Mustard, my dear blog friend Indosungod raised her eyebrows (ok I didn't see but am sure she did) said (to the effect) "You use mustard paste in your cooking". That hit me hard, I have blogged for almost 6 months now and have not conveyed to the world that Bongs adore Mustard paste and their most keepsake recipes are the ones that have Mustard paste or Sorshe Bata in it. What am I, a disgrace to the Bong Culture? Am I the prodigal bong female that Bong Gurus gossip about and dismiss with a nod of their head while gulping their hot-hot tea and chicken pakodas? Am I that abhorred Bong Mom in the night-time stories told by the millions Bengali mothers to their little ones, the one who went across seven seas and forgot the mustard paste ? Or maybe I am the one who forgot her "Shankha-Pola"(Red& White Bangles symbolic to marriage in Bengal) and her sorshe bata and became "Amrikan" and lost her roots as the Ma-in-law in one of the many Calcutta homes would be whispering to her soon to be NRI daughter-in-law. Sorshe Chingri Bhape is a popular and traditional Bengali dish. 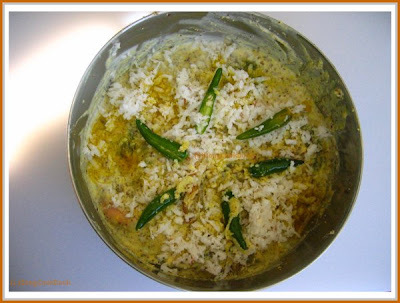 Best enjoyed with white rice it has satisfied numerous Bengali palates at lunch as well as dinner. Simple and easy to cook it plays on the taste and flavor of mustard. The Mustard-Poppy Seeds Paste ~ use almost 3/4th of the paste, makes little less than 1/2 cup. If the paste is too pungent for you, you can sieve the paste and use the more liquid mustardy water mixed with a little of the thick paste. Yogurt ~ 1/4 cup thick beaten yogurt. Use 1/2 cup of yogurt for more gravy-ish dish. 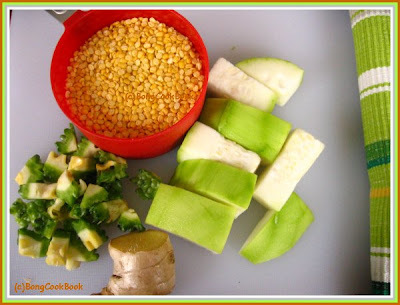 Make a smooth paste with mustard seeds, poppy seeds, 3 green chillies, a little salt and water. 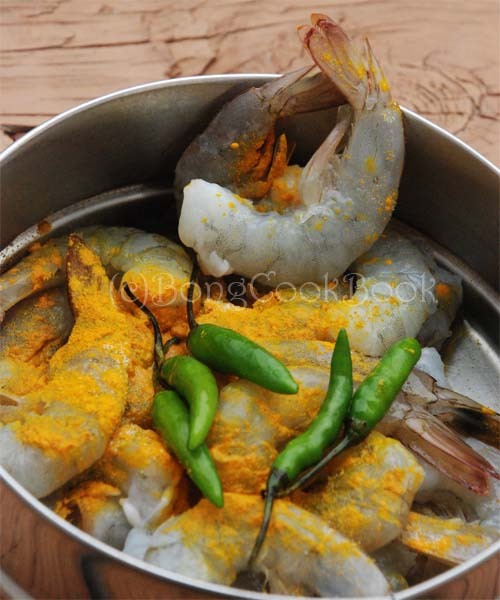 In a container which you can steam or which you can put in the pressure cooker, mix the prawns with mustard paste, yogurt and salt according to taste. I also add just a pinch of sugar. Add some fresh grated coconut to this. 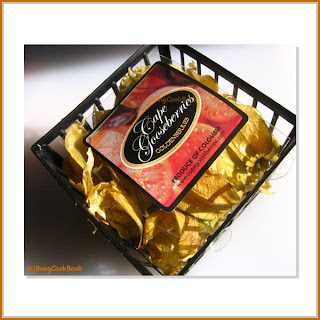 If using frozen grated coconut defrost and then use. Now put water in the pressure cooker bottom and put in this container. 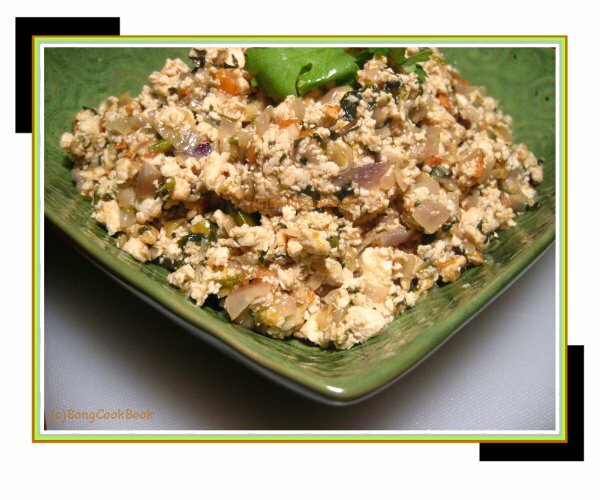 Alternate Recipes: The same recipe can be applied to Paneer and is called Bhapa Paneer. I think this is what Ashwini meant, when she left a comment about Bhapa Paneer she had at her friends place. You can also try this with Salmon. Though I have never steamed Salmon. I use this same method and then bake the salmon, covered at 375F. 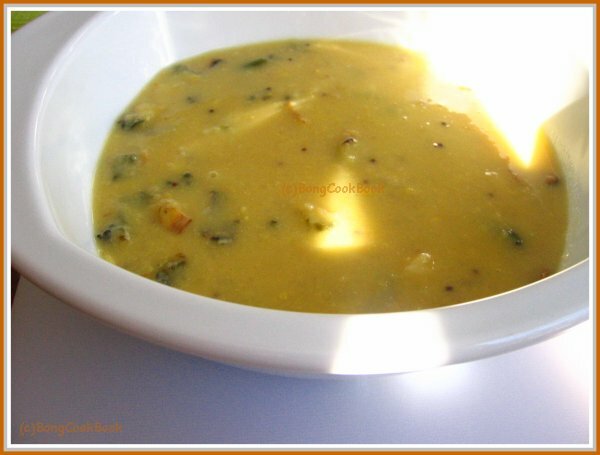 …or My Mother's Bitter Dal is a Dal or Lentil Soup with veggies like Lauki or Bottle Gourd and Karela or Bitter Gourd. This is also an entry for this week’s WHB from both me & my Mother. 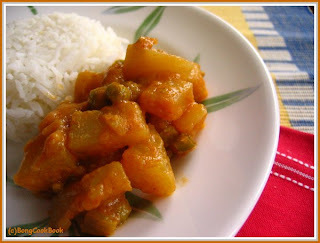 I wanted to highlight the vegetable Karela or Bitter Gourd for this week’s WHB hosted by Anna of Anna's Cool Find. Karela or Korolla as we say in Bengali and its smaller cousin Uchche, which I can rarely find in the stores here, is a very popular vegetable in Bengali cuisine. As I said earlier (in Shukto post) the first course of a Bengali meal is usually bitter to cleanse the taste buds. 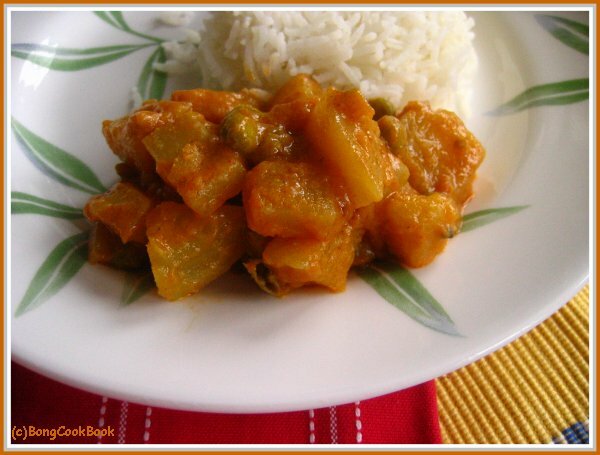 The Bitter Gourd serves this purpose delightfully and so is much loved in Bengali households. Uchche Bhaja - Thinly sliced Bitter Gourd and then fried, Uchche Begun – Bitter Gourd and Eggplant chopped in small pieces and then sauted, Uchche-Alu Seddho – Bitter Gourd and Potatoes simply boiled and mashed with little mustard oil and salt are almost every day part of a typical Bengali cuisine. And Bengali cuisine doesn't want to get rid of the bitterness of Bitter Gourd, no way, they need that bitterness in full volume. Me who did not love this bitter tasting veggie much had a hard time growing up as any one can imagine. Even now while D chomps on boiled Karela gleefully I swallow it down with water and sugar!! I guess it's an acquired taste and not everyone can appreciate the bitterness. However as I grow older or old as is the case, I appreciate this veggie more and try to incorporate it in some form in my diet. 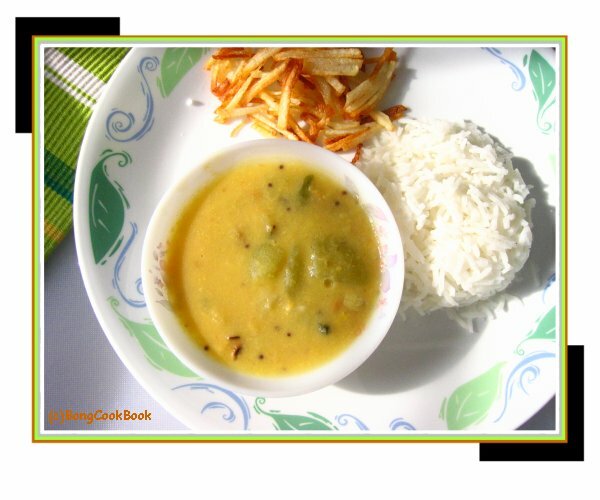 This Dal is best enjoyed with white rice accompanied with a veggie side or with some veggie fritters and usually served at lunch. 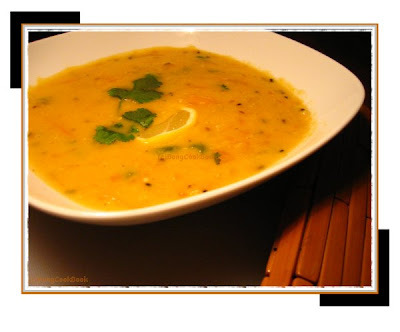 This is served not only as an everyday dal but also if you are serving a traditional Bengali lunch. 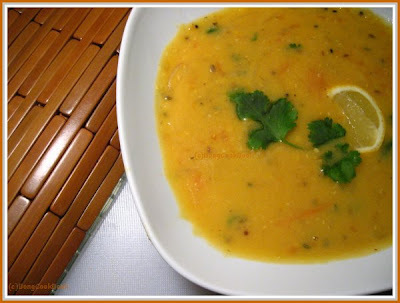 You can also have it by itself like I did yesterday, a bowl of this Dal with some crisp salad of finely chopped cucumber and carrots in lime juice. Wash, Peel and chop the Lauki or bottle gourd in large pieces a seen in the pic. The bitter melon more typical of India has a narrower shape with pointed ends, and a surface which is ridged. 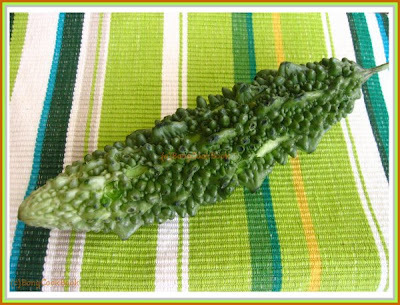 It looks like the one shown in the above pic and is known as Karela in Hindi and Korolla in Bengali. There is another smaller variety which is commonly known as Uchche in Bengal and is supposed to be more bitter. Bitter Gourd aids or stimulates digestion. It is also very useful in treating Diabetes Melitus and helps control Blood Sugar. Compounds in this bitter vegetable may also be effective for treating HIV. Check Wiki here for more info. 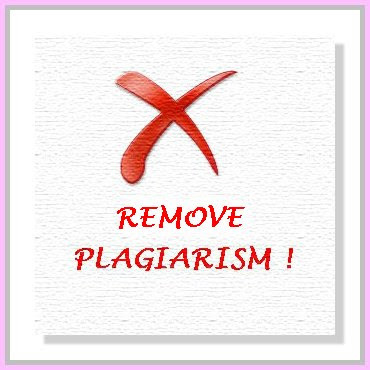 Plagiarism -- much has been said about it and I am not going to reiterate. But it hurts to see when the content and the pictures we so lovingly create and put up being stolen and used. Most of us bloggers, blog to vent their creativity, they find it as a channel to showcase their passion, to share what they love doing with million others. However when we bloggers want to protect our content and we state that explicitly in the copyright statements all we expect is the user to use that information but not to lift it straight off our web page. We want them to post a request in the numerous comments that we have, to ask our permission, to use the content if permission is given and in the manner the owner says and last but not the least to give due credits. This is not much to ask for, after all we are entitled to our creative copyrights. "Yahoo! respects the intellectual property of others, and we ask our users to do the same. Yahoo! may, in appropriate circumstances and at its discretion, terminate the accounts of users who infringe the intellectual property rights of others. " There are three kinds of Mustard seeds -- Black, Brown and White/Yellow depending on the Mustard plant. Mustard paste or oil adds a sharp, spicy taste to food. 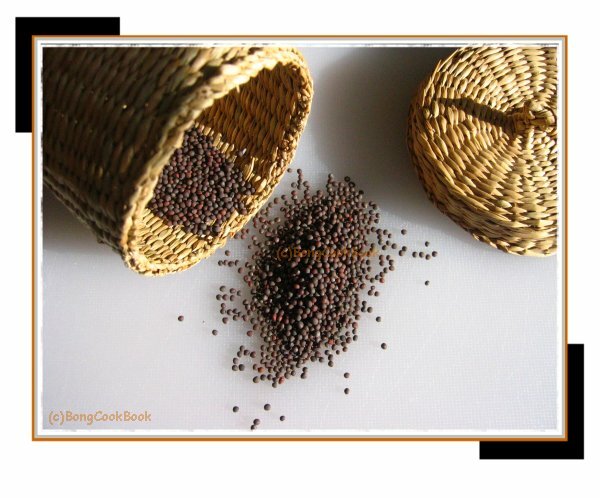 Both the Brown and Black Mustard seeds are used in Indian cooking, the brown one more popular for making the paste. Update: From the coments I gather that many of you are unaware of use of mustard paste in Bengali Cooking. We grind mustard to a paste with green chillis and salt and use that extensively in many of our cooking. This cannot be substituted with the Mustard Sauce we get in stores here as it lacks that sharpness. 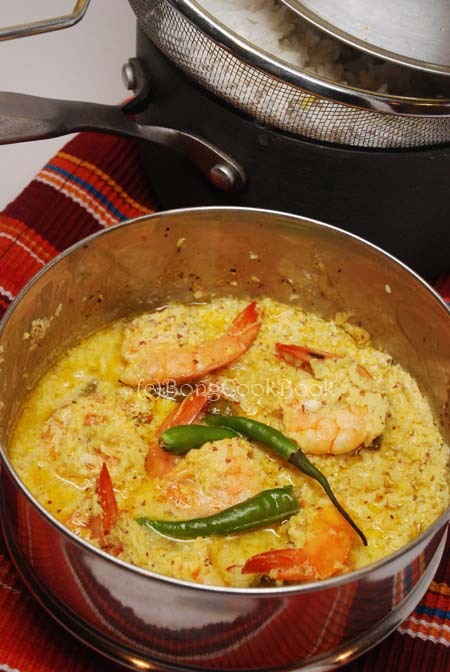 A particular mustard based sauce called "Kasundi" is very popular in Bengal. 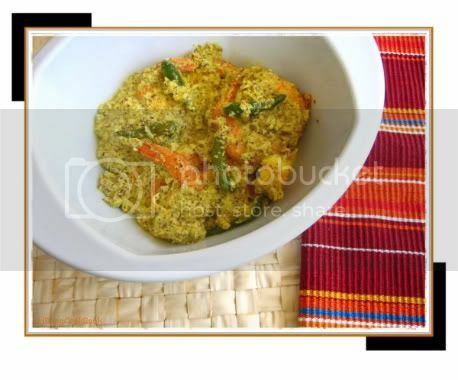 It is used as a dip and is best when eaten with rice and alu seddho (boiled potatoes) or any sauted greens. Sorshe Bata or Mustard Paste is ubiquitous ingredient in Bengali cuisine. 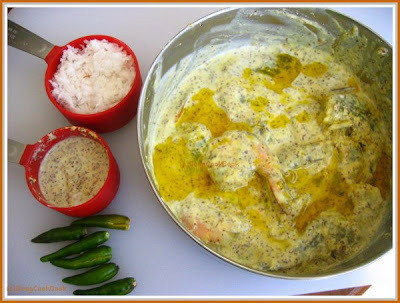 The best Bengali fish curries always have a mustard based sauce. Even vegetarian dishes like Shukto, Charchari (shall blog soon) etc. have mustard paste as the only spice. The black mustard when ground to a paste may be slightly bitter so it is ground with a little poppy seeds (optional) and green chillis and salt. This somehow never happened at home when the Shil Nora was used for grinding. Radhuni is not mustard, it looks more like Ajwain and maybe in the same family, but it is not Ajwain and has a stronger smell & flavor. Its hard to get Radhuni outside Bengal and I don't have any. So add that little Mustard to your food in whatever form you like best and enjoy. I do not get the opportunity to leaf through many cookbooks to decide "What’s for dinner" or "lunch" or "snack". Not that I don't want to but simply because I don't get time. While coming to US I had packed two Bengali Recipe Books written in Bengali with me. One of them doesn't have great collection of food but I loved the author, Leela Majumdar, and her all other Literary works, so had to buy it. The other is a very ordinary looking book, no glossy pages, nor any nice pictures, no glam-sham that is, but has a very good collection of Bengali Recipes. Albeit this book is like me & Ma, it doesn't give any measurements, just the ingredient list and a general way to prepare, it has most of the Bangla Recipes I have ever heard of. 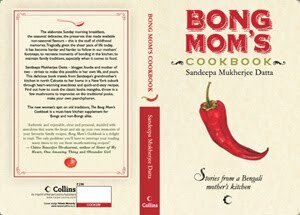 Bengali Cook Books written in Bangla were not much in vogue in those days .Recently some very good cook books for Bengali recipes have been published but most of them are in English. Me on the other rely a lot on the internet (other than Ma, friends & THE magazines) for recipes. It's easy, fast and convenient. So no wonder when I chanced upon food blogs I was delighted. What with their glossy design, beautiful pictures and all the traditions and tips thrown in they are better than any cook book for me. At this point I need to narrate a funny incident. My daughter, who is in the "pretend play" stage, is extremely imaginative and goes on "Imagine, Imagine" all day. So a couple of nights back she was sitting on my parent's bed and planning a B'day party for her two dollies. So my Dad said "What are you going to cook"
She says "Chole & Chicken and Bhatu (Rice)"
My Dad says "Ok, so ask your Mommy for the recipes"
Sailaja's food blog -- SailusFood is a wonderful place to be, her neat layout, the succinct steps and the crisp pictures give an idea as to what to expect of the dish. The moment I saw the "Chicken Masala Balls" in her recipe I knew all of my family and friends would love it and boy did they. Now it has become a kind of regular at my home. But since I make it so often I try not to fry it every time, though the fried ones taste the best. 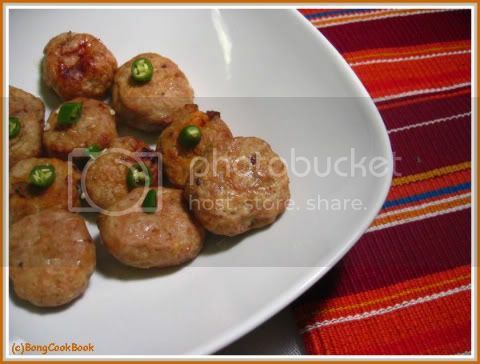 Thanks Sailaja for this wonderful recipe and many more that I am going to blog soon. 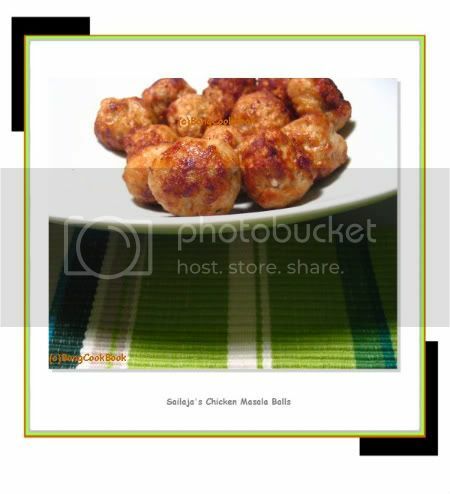 So here’s my entry for this months MBP February-- Chicken masala balls from SailusFood. Thanks again to both Sailaja for this recipe and Coffee for hosting this wonderful event. For the fear that soon Sailaja will get famous and her agent might restrict access to her blog I am jotting down the ingredients and the steps I follow here. Though Sailaja asked to roast the dry spices in oil and then blend, I dry roast them and grind them in my dry grinder. The dry powder I store for future purposes too. Then I make balls exactly as she does. I also bake these balls for weeknight dinners. Spray the baking pan with Oil and bake them at 350F till they are lightly browned and done. Tastes yummy with Rotis and by themselves. So the Valentines Day is over and here I have something for all your hearts which went through a lot on this day. So here’s to a healthier, better HEART --- Tofu. 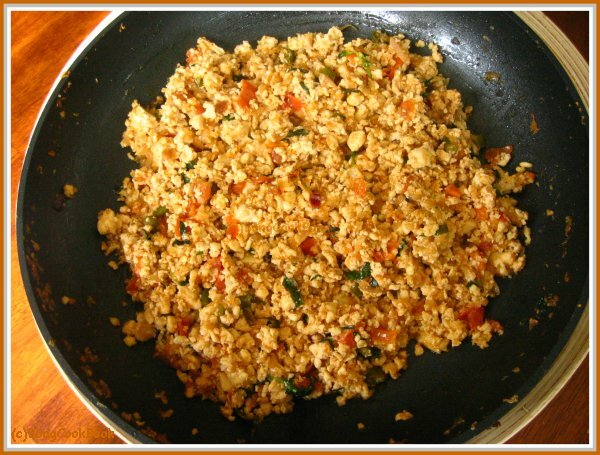 Tofu Burji is something I learned recently from my wonderful friend S. The first time I had it , it tasted so good, I didn’t believe it was tofu, I was sure it was eggs. It is sooooooo tasty that you have to eat it to believe it and even if you are not a big time Tofu fan, I insist, yes insist that you try it at least once before giving a verdict. Add the green chillies if you want them. Taste to see if it tastes like scrambled eggs, if not yet, you need to sauté a little more. Trivia:The English word "tofu" comes from the Japanese tōfu which itself derives from the Chinese dòufǔ. 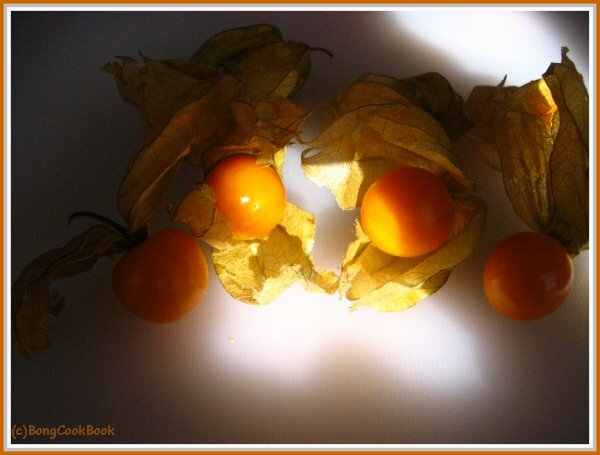 Though Tofu is of Chinese origin in both languages it means "bean curd"
Gooseberry ? That’s what the package said. The fruit that you see in the above pic was known as “Tya(n)pari” in Bihar, it was sold by the cartful on the roadside and we used to love it. It was not much seen in Kolkata, the strange thing being D had never even heard of it. He would laugh at me whenever I said this name and was I elated to see this small pack in my local Shop Rite fruit aisle a month ago. 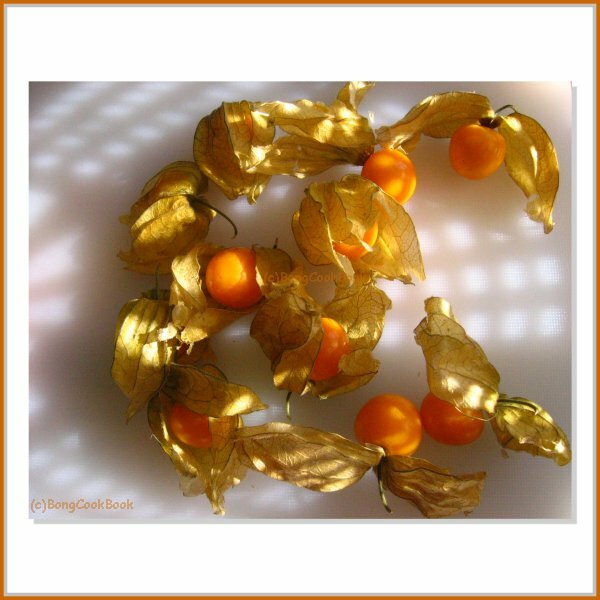 Though the package said Gooseberry I think this the “Cape Gooseberry” according to Wiki. 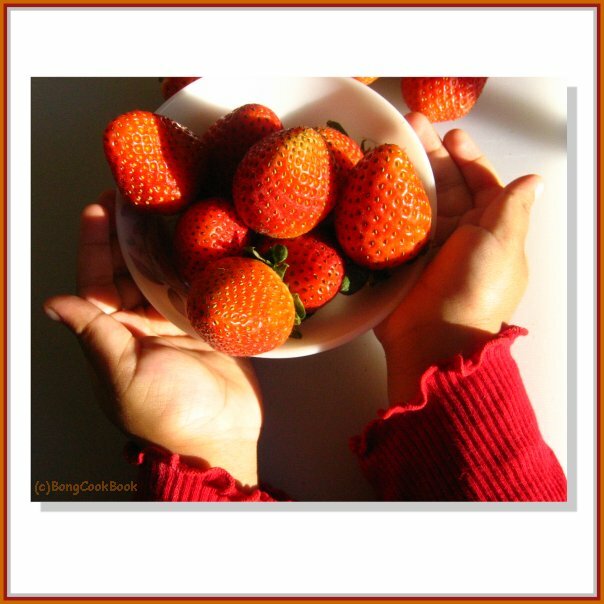 It is sweet and juicy and I love eating it raw. If you know more about this fruit please input your info. Can you discern the heart in the picture? I didn’t plan it but when I saw it on my computer I was sure it was all because of Valentine Day and I had to write something I had wanted to keep to myself. Ok, so let me come clean, I have stopped being a Valentines Day Fan. I feel it's overly hyped and there is too much brouhaha with it and the commercialization -- the less said the better. Maybe I don't feel any attachment to this tradition because I have not grown up with it, Valentines Day was unheard of when I was in school, at least there was not much hullabaloo over it in our small township. At the close of the teens there was this hush in the air about this day and it was solely marketed for "romantic couples", we felt it was supposed to be for errrrrr stupid females with bfs, we ( the more stupid ones) had none so that was it. By the time I was in college and we had moved to the city with an "Archies" store at every corner, the cute pink bears holding red hearts and the mushy-mushy card made my heart flip and if you would sniff hard, rising above the diesel and the fumes you could smell the red roses and "Love". That was the age to go rubbery in the knees on seeing such things and if someone so much as dropped the "L" word you would go red -pink & purple, ok not purple. "Archies" did a very good job of putting pressure on the millions of Indian youth and I bet even that gangly youth with oiled hair from Jhumritaliya shyly scribbled on an “Archies” card for the love of his life. No such luck for me though and even later when I was friends with D we never succumbed to Valentines Day, the V day was still very much targeted for the mushy-mushy lovey-dovey couple of "Maine Pyar Kiya" and no way I was going to be labeled in such a category. This changed however after marriage, the first Valentines day I totally flipped and sent a card worth 50 bucks to D who was far from India at work on an project. I was sane enough not to spend more of my hard earned bucks on postage and sent it with another good friend who was traveling to the same place around this time. Fortunately this was a guy and "happy & gay culture" was not in so there was no confusion as to "who gave the card to whom". Since D did not send a card or claimed that his card was lost in transit I threw a hue and cry…all those years of not celebrating V day and "Archies" & now "Hallmark" was showing signs. So by the next V day when we were here in the "Valentines Day Mecca" D promptly bought me a bunch of roses, roses on V Day are you crazy ?? I was apalled by the price and again threw a hue & cry. By now the poor guy would have been confused but he knew me well enough not to get ruffled. So the next year I asked him to get me a single stem of rose, that's it. Trivia: March 14 is celebrated as White Day in Japan & Korea by a concentrated marketing effort, when men are expected to return the favour to those who gave them chocolates on Valentine's Day. Valentine's Day has emerged in Japan and Korea as a day on which women, and less commonly men, give candy, chocolate or flowers to people they like. This is known as Kohlrabi here in the US and as Lakshmi pointed out till date I have seen it only at the Asian Stores, the Indian stores don’t carry it. In Bengal we have different kinds of gravies and classifying all of them as curry would be shameful so though this is a curry based dish I am not calling it so. "Dalna" in Bengali means a thick gravy based dish as opposite to a “Jhol” which is a very light gravy more on the liquid side. 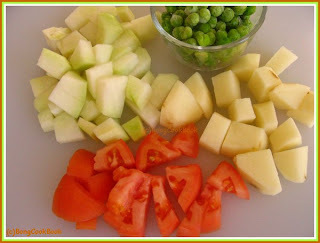 Olkopir Dalna or “KohlRabi in a Gravy” is a spicy gravy of cubed kohlrabi, potatoes and peas thrown in. The gravy is tempered with methi(fenugreek) seeds and whole garam masala and spiced up with ginger, tomatoes and cumin and corriander powder. 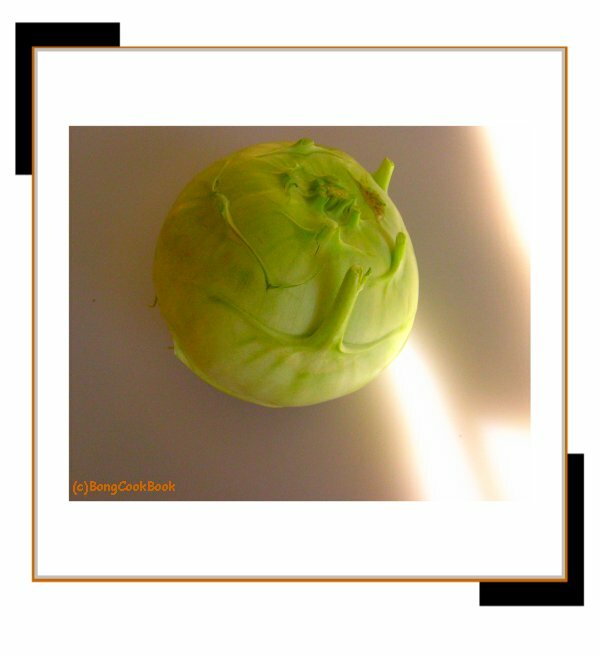 Though Kohlrabi resembles the turnip , when cooked this way it tastes more like a squash. Olkopi/Kohlrabi ~ 1 peeled and cut into small cubes. Be careful not to buy the older ones as they get a little tough. Cook the tomatoes well till you see the oil separating. Saute till the masala coats the veggies well. Fry for a couple of minutes. Add about 2 cups of water and cover and cook till veggies are done. The dish usually has a little gravy so adjust the thickness according to your taste level. The kohlrabi has a slight crunch and I like it that way. 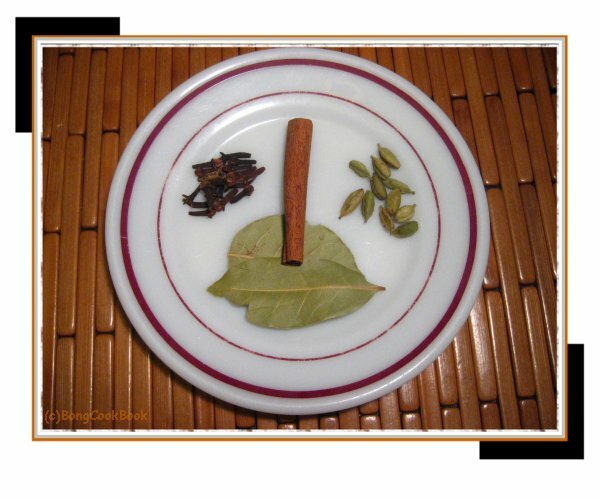 In North Indian and Bengali cuisine Whole Garam Masala and Ground Garam Masala play an important role. If you have paid any attention to my recipes till date you will find in most I use Cardamom, Cloves, Bay Leaves and Cinnamon or whole Jeera for tempering. This is in sharp contrast to the cuisine from South of India where the spices for everyday tempering is Mustard seeds and Curry leaves. The different spices used for tempering lend a different flavor to the oil and hence the food. While Whole Garam Masala is used for tempering, ground garam masala is mixed with the food at the last stage of cooking to lend a flavor and aroma and peps up the dish. 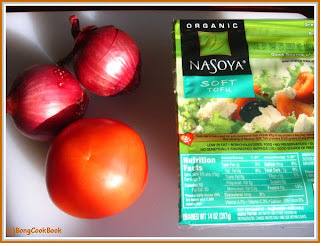 I use the Ground Garam masala mostly for meat dishes and if I want to make a dish rich & spicy. Ground Garam Masala is sold at stores in several varieties. But most of the time I dry roast the above whole spices and then grind them in a spice or coffee grinder to make the powder. In many regions the Bay Leaves might be omitted while grinding. Though "Garam" means hot, this hot is not the same "hotness" as in peppers. This masala helps increasing the body temperature and so makes it "garam". Now to dispel some myths -- dear Supriya said I am "fun loving and adventurous". Fun loving, yes but adventurous, have my serious doubts on this one. The most adventurous I am is when we go out to eat, I always end up taking the less trodden path i.e. deciding on something I have never even heard of before and then almost always end up eating what D has ordered. In other walks of life, less said the better. One more...another blogger buddy Sra said she thought I was cherubic. Now I would love to think what she meant was I had an "angelic demeanor". However what she must have actually meant is I have a "chubby" appearance :) and I must give it to Sra for her insight. I am inclined to put on weight easily, no luck like Shilpa here and have never been skinny. I have a penchant for hoarding...no no don't get me wrong..what I mean is I just cannot throw/give away stuff as in books, old shoes, old clothes etc., I cling on to them. I still have almost all the issues of the "Anandamela" a very popular children's bi weekly magazine in bengali, I used to subscribe from LKG to High School. My Ma threatens to sell them each year. Now whenever I have to sort my lil' girl's clothes as she outgrows them, I am tormented. Maybe that's another reason I like computers, just store. I love, love, love to read fiction both in bengali and english and I like learning as in go to class, take part in hot discussions, do assignment, give test. Strange as it may sound and though I cursed when I had to study, I now realize that I really like the process. I was in the hospital for the last 17 weeks of my pregnancy, yeah 17 you didn't read that wrong, due to some complications. I was in total bed rest and was allowed to get up for occasional showers only once in a week or so. That experience taught me a lot and made me a better person I think. I now know how important everyday things that we take for granted are and I know when God closes one door he opens another, we just need to have faith and believe. Ooop six already...stop, stop that's it. I would like to tag IndoSunGod, Sri and Maheshwari if they haven't done this already. Take it only if you want to.